Participating is more important than winning. At least that is the olympic spirit. This is where this page is all about. 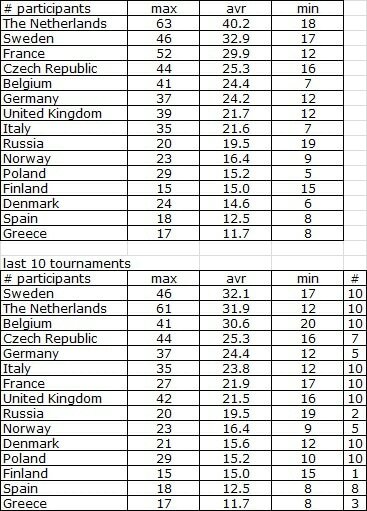 Statistics on participating tournaments of the European Grand Prix. 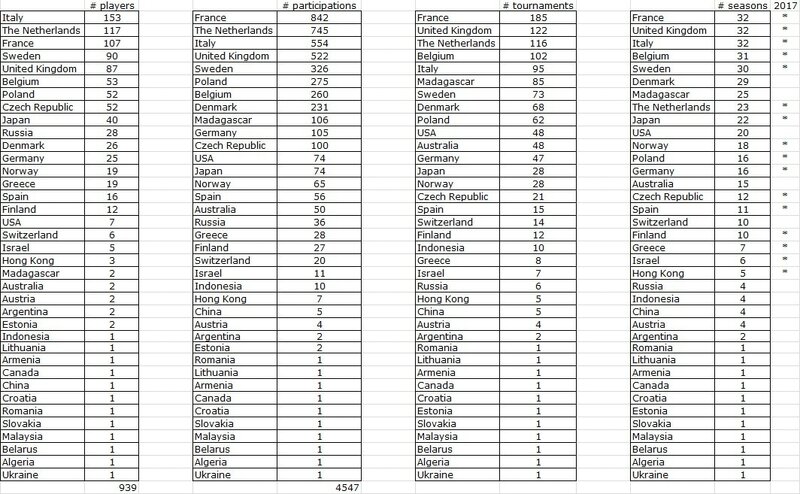 No less than 939 players participated one or more European Grand Prix tournaments. 783 are male, 156 are female. 37 country flags are represented among the participants. Italy has the most unique players, but French players have the most participations. Three countries had participants in all 32 seasons. 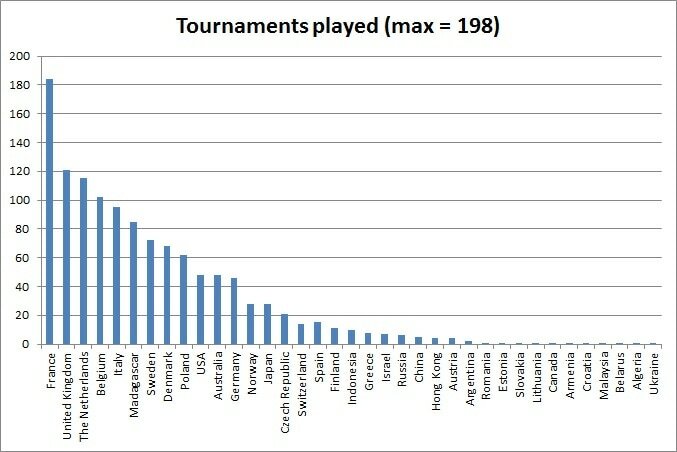 France has by far entered the most tournaments. 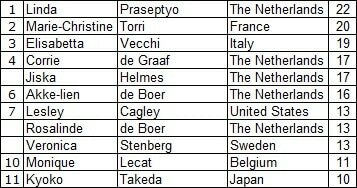 In the early years on average about 10 countries were represented on season base. With a new revival as of 1999 and the introduction of more organising countries, this average went up to 15. In 2008 the 11 hosting countries welcomed no less than 20 nationalities. 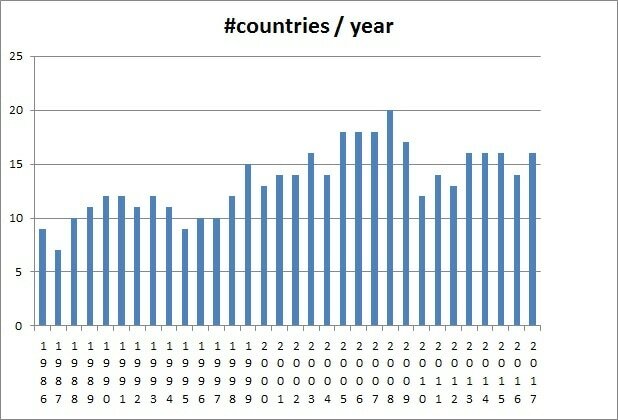 After the introduction of the EGP cycle with less organising countries a year, there has been some (logical) decline, but the average of the last 3 seasons is back to 16 now. 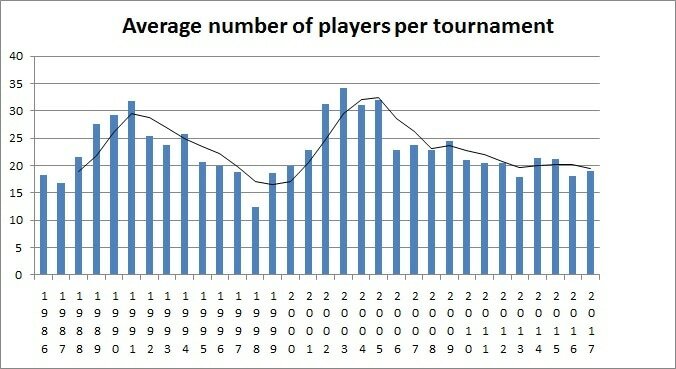 In the early days the number of players per tournament went up until 1991, after that it starting declining. The absolute minimum was reached in 1998 with less than 13 players on average. After that it started to raise rapidly. As of 2006, with the introduction of new countries every year, the average went down again. In 2010 the EGP cycle was split into two series, but that could not stop the decline. The minimum was reached in 2013, 2014 and 2015 showed the start of a positive trend, but 2016 was once again less attended. 2017 so far is also below average, but the last three tournament promise to be well attended! 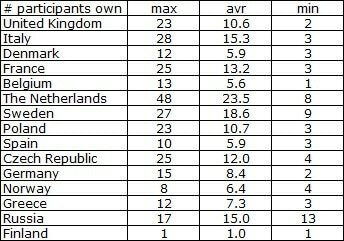 An all time maximum, average and minimum for all organising countries is represented below. 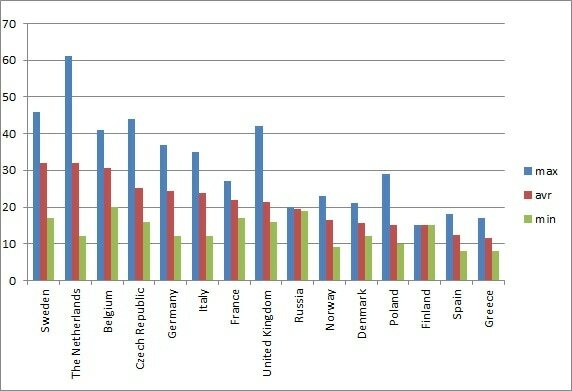 The Netherlands is still well ahead of Sweden and France. It has to be said that some countries organise for almost 30 years, while some countries only had a small amount of tournaments. 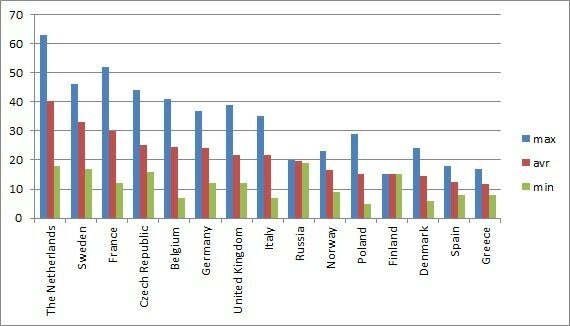 Therefore a second graph is present showing the same for the last 10 editions. 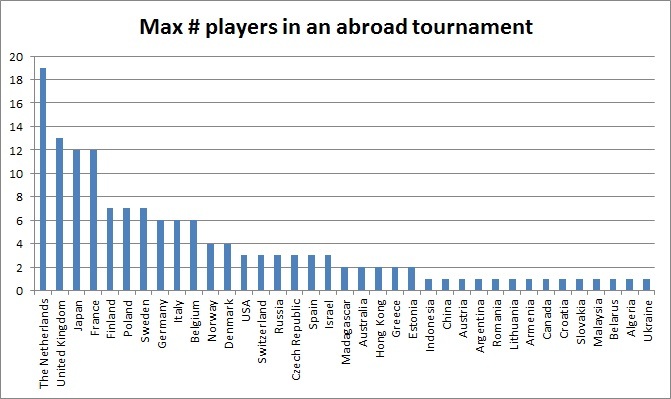 Traveling abroad is not easy for all players, but some countries have sent out several at once to a single tournament. United Kingdom, Japan, and France are doing well in this statistic, but the Netherlands have set a real high score in Ghent 2015. It is very country dependent how many players compete in a home tournament. 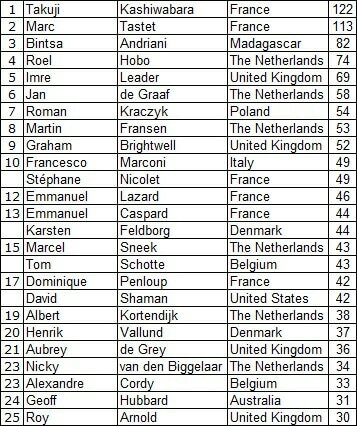 The Netherlands has the impressive record of 48 Dutch players playing in one single event. 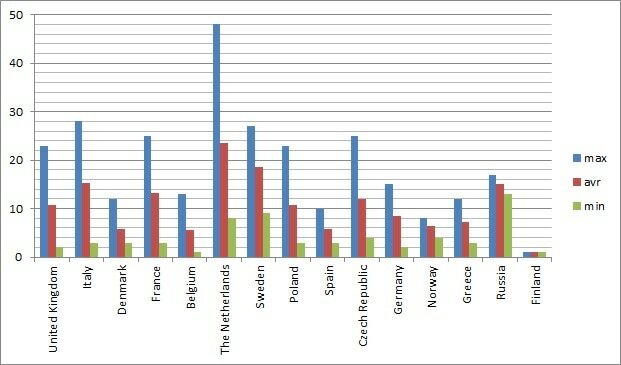 Belgians, Spaniards, Norwegians and Danes are apparently very difficult to convince.